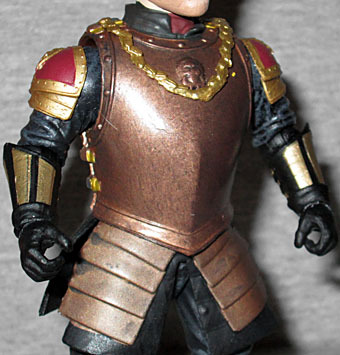 In the first series of Funko's Game of Thrones action figures, I only got five of the six toys - the choice to release Tyrion in his armor before his more normal clothes seemed weird to me. But at this year's SDCC, Funko offered an exclusive version that I couldn't pass up. "Don't fight for a king. Don't fight for his kingdoms. Don't fight for honor, don't fight for glory, don't fight for riches, because you won't get any. This is your city Stannis means to sack. That's your gate he's ramming. If he gets in it will be your house that burns. Your gold he steals, your women he rapes. Those are brave men knocking at our door. Let's go kill them!" The youngest of Tywin Lannister's children has known since birth that his father despises him. It is his outsize wit that helps Tyrion bear the misfortune of having been born a dwarf to a mother who died in childbrith. Handicapped by his size, Tyrion had never before seen battle before Blackwater Bay, and long depended on Jaime, the only immediate family member with any affection for him, to fight on his behalf. For the most part, this SDCC-exclusive figure is identical to the mass release. 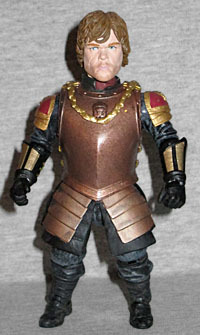 Tyrion is wearing his specially made suit of armor, featuring a smooth breastplate with a lion's head crest just below the neck. The necklace, an interlocking series of small golden hands (which, in the books, is Tyrion's symbol as Hand of the King, rather than just reusing Ned's brooch) is a separate piece glued to his shoulders, but enterprising customizers could doubtless pry it off with no trouble. He has more lion heads on his pauldrons, and is wearing black clothes below all the armor. There are wraps around his lower legs, with the tied ends dangling at the back. Comparing this toy to the actual costume from the show, it's an almost perfect match! Funko promoted this figure as having a new head, and that it certainly does - though don't be surprised to see it again later. The sculpt of the hair is slightly different from the first Tyrion, and he has the diagonal scar across his face. And that's fine, but it shouldn't be a scar, it should be a big ugly wound - it took weeks for his injury to heal to the point that it was no longer a raw red gash, and yet this toy is meant to represent Tyrion moments after he was struck. 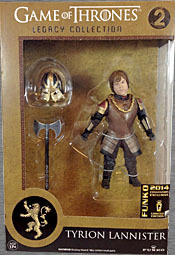 It's a very good likeness of Peter Dinklage, but it seems obvious this was designed with future re-use in mind. 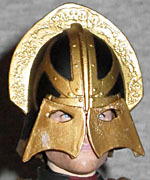 If you don't like the head on this figure, you're in luck: the other thing that sets this exclusive apart from the normal version is the inclusion of his distinctive helmet. It's the same worn by all the Lannister forces, all black and gold with a horizontal crest over the top and functional plates that cover the face. Yes, functional: the toy has hinges so the flaps can open. The helmet fits on tightly, and won't fall off when you don't want it to. Other than that, his only accessory is the same as the figure you could get at Barnes & Noble or through your local comicshop: an axe. Because every dwarf wields an axe. Yes, he used this axe in the episode this figure's based on, but we've also seen him carrying a sword while dressed this way (it's even shown on the back of the packaging). Is it greedy of us to ask for a sword, too? It's not like Tyrion is a large figure. Despite his small size, the figure has as much articulation as the other figures in the line. Well, okay, there are no double-hinges for the knees or elbows, but he does have a balljointed neck, swivel/hinge shoulders, elbows, and wrists, a balljointed torso, balljointed hips, swivel/hinge knees, swivel shins, and swivel/hinge rocker ankles. One of the knees on my figure is stuck, and since this entire line has a reputation for the clear plastic joints breaking, I'm not trying to force it. There are plenty of poseability options even without that knee. This is our seventh Game of Thrones Legacy Collection review, and yet somehow we've managed to go this far without any mention of the line's packaging. Funko is definitely taking its cue from Mattel here, in that they're just looking at successes Hasbro has had and are copying that. The Legacy Collection figures are sold in window boxes that recall the Star Wars Black Series in everything but color. It's a rectangular box with a window wrapping around the right side, and a circular element in the upper corner (in this case, the figure's number in the series, rather than a stylized headshot). The character's House Sigil is down in the lower left corner, and also on the left side of the box. The back has a photo of the character, and a list of all the figures in the series. 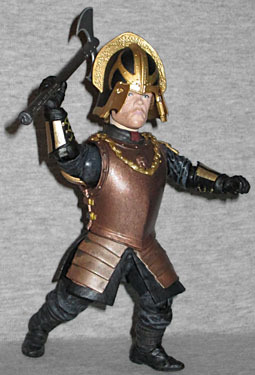 Each figure gets their own color box, as well: Tyrion's is a golden mustardy yellow. I've said before that if there are two versions of the same toy that are functionally identical, except one of them comes with more accessories, it makes no sense to buy the one that has less. That isn't the reason I passed on the mass market Tyrion Lannister, but it certainly made my decision to get this exclusive feel better. He's just as good as the other GoT toys, but the new head and the exclusive helmet make him better than the standard release.